TravelSkite: "Every Silversea passenger is special." Marketing gold: that's a direct, overheard, quote from a passenger to another passenger - and, further, from Silversea newbies. It was prompted by observing, from the ninth level pool deck, the welcome party in place on the dock directly below, waiting to receive back into the Silver Spirit's warm embrace those passengers who had been out that evening enjoying a classical concert in front of the library at Ephesus. 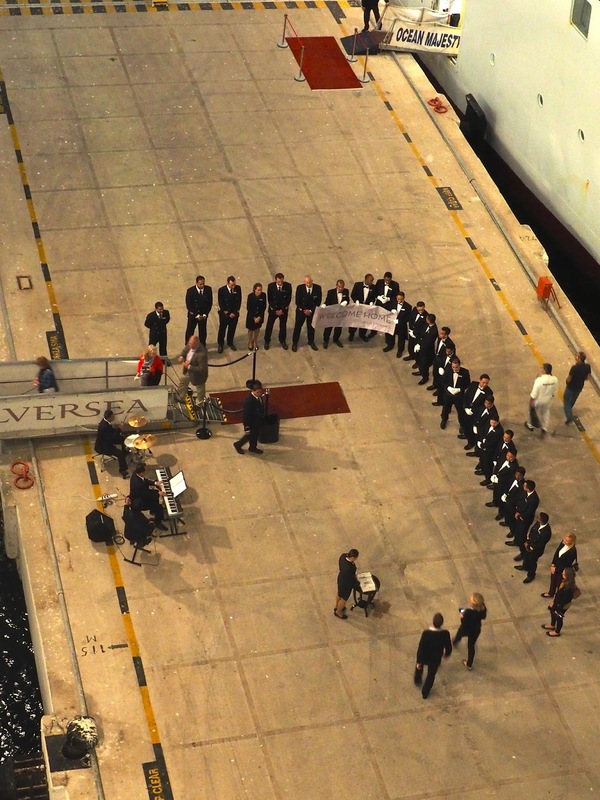 I watched too, the 20+ mostly white-gloved butlers in a right-angle on the dock holding a 'Welcome Home' banner while a drums and keyboard combo played jaunty music, waiting patiently until the Silversea passengers eventually started straggling back along the pier. Meanwhile, some of the people cruising with the Ocean Majesty opposite walked along the same pier, slinking behind the butlers to cross the gangway into their own ship to no fanfare whatsoever. As an illustration of the concept of Them and Us, it couldn't have been surpassed. Of course we felt smug! Starting and ending with some excellent work by the sun, it had been a good day, as any that involves a trip to Ephesus will be. Even having been there so recently, I was still impressed by the scale of this archeological site, the care with which it's being revealed and restored, the famous feet that walked the same polished marble pavers that I did, the sheer beauty of the stone. And the cats, of course. I have to say, it was prettier in April, with the poppies, but the cats certainly helped soften the hard surfaces. But oh! The people! In April it was relatively quiet; today it was heaving - and that was with only three cruise ships docked in Kusadasi. Sometimes there are more, and bigger. So the processional way was heaving - as, in fact, it must have been back in the day when there was an event - and the Library was awash with people. This time, I went inside the separate excavated terraced houses section, under expensive cover funded by Austria, and saw the world's biggest jigsaw puzzle: thousands of pieces of broken marble slabs, shattered by an earthquake centuries ago, and laid out on tables to be painstakingly fitted back together as many already had been. It was worth seeing. And then, just to make things even more interesting, not only did I learn via Twitter that a friend from Auckland had been in Ephesus today too and was now dining on her cruise ship one pier over; but also that her ship, and another, had both been involved in assisting refugee boats on this busy bit of water as they made their way towards Greece. Where we will be ourselves again, tomorrow.